Highland Opportunity Limited has opened a new enterprise centre in the Pulteneytown area of Wick. 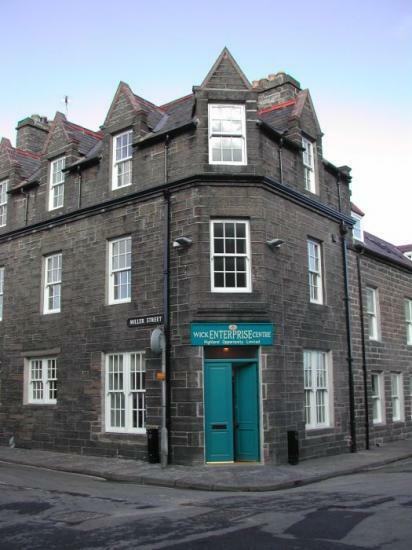 Located at 9 Miller Street, the Wick Enterprise Centre provides a base for Highland Opportunity Ltd's business advisory service to Caithness and Sutherland and offers flexible workspace for small businesses who are seeking an office presence in the town, together with a small meeting room. An occupation licence covers all costs of a workstation: rent, rates, light and heat, cleaning and wireless broadband access. Licences are flexible in duration from a week to a month to a year, with easy termination. They cost �60 a week or �250 a month plus VAT. Jennifer Irvine is the local advisor for Highland Opportunity and is based at the Wick Enterprise Centre and was formerly based in High Street, Wick. Jennifer can advise on low cost loans and funding available from other sources for businesses starting up or looking to expand. Highland Opportunity Limited offers loans at interest rates lower than commercial bank rates, currently set at 5% on outstanding amounts, to new and growing businesses in the Highland Council area of Scotland. The priority is for loans from �1,000 to �50,000 which can be unsecured where there is a strong business plan. Loans over �50,000 and up to �250,000 will only be considered where there is a sound security over a business asset and there is a compelling case for economic development in the Highlands. Contact Jennifer Irvine at the Wick Enterprise Centre for more details or check the Highland Opportunity web site. Small firms from across the Highlands will get the lowdown on how to tap into traditional and alternative sources of finance at an event in Inverness later this month. The Federation of Small Businesses (FSB) has joined forces with local business experts Highland Opportunity and their Business Gateway service plus MSP, Rhoda Grant, to host a special event -Accessing Business Finance - at the Inverness Caledonian Thistle Stadium on the 29 April. Starting a New business? Find out what deductions, reliefs and allowances you can claim to help reduce what tax you pay..
A Business Gateway film suggesting ways to finance your business.. Check out www.highland-opportunity.com. The business of HOL is that of an Enterprise Trust for the Highlands � a body whose purpose is to stimulate economic activity, promote the start up and growth of business ventures including social enterprises, to help create new jobs, improve access to employment and foster business activity and trade. Whether you�re starting or growing your new business, find out how we can help make your business idea a reality. For assistance with your new or existing business, call 0845 609 6611 or request a call back. Business Gateway Highland has created two new services for businesses in the Highlands with the aim of creating new jobs and helping businesses to grow. One of the new services offered by Business Gateway Highland will help create new jobs in some of the region's most remote, rural areas. FREE Business Gateway Workshops For New and Existing Businesses. Thinking of starting your own business in the next few months, or developing your existing business - then contact Jennifer Irvine, Regional Development Officer, Business Gateway, Caithness.